Overpopulation in East Africa: Thomas Malthus, Stephen Hawking, and Dan Brown are wrong. Is Overpopulation Really the Problem? Reality-checking Thomas Malthus, Stephen Hawking, and Dan Brown. A mother carries her baby on her back near the Jesuit-run Upendo program in Nairobi’s Kangemi slum, on April 23, 2013. With no sport utility vehicles in sight. Nelson Maina’s physical vigor and ropy, muscled arms belie his 72 years of age. He and his wife, Miriam, and a revolving cast of children and grandchildren share a two-room shack at the edge of an enormous trash heap near the center of Mukuru, a slum in the Kenyan capital of Nairobi. Vivid blue paint brightens the shack’s corrugated iron siding, the walls only a few meters wide. Asked how eight children and seven grandchildren inhabit such a tiny space, Nelson shrugs and smiles. “It’s normal here,” he says in Swahili. On Jan. 1, 2050, 9.5 billion people will greet the new year, according to projections the United Nations released in June. By 2100 the number will approach 11 billion. 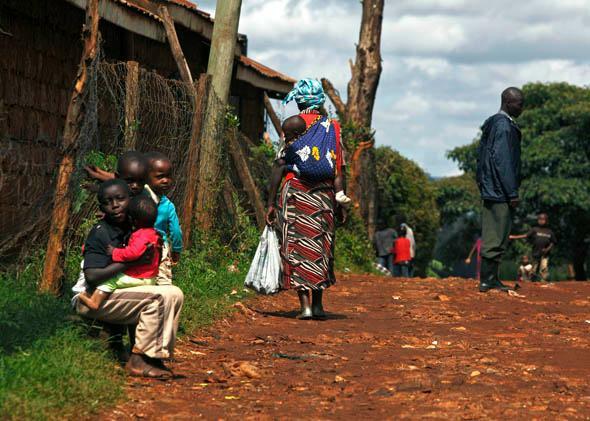 Mukuru has one of the world’s highest birthrates, and its living conditions are so abysmal that average life expectancy does not extend beyond 50 years. Cries of alarm have greeted the U.N. numbers, and if you are searching for a location on the globe to illustrate the perils of overpopulation, you can find little worse than Mukuru’s smoky, unordered depths. And yet what makes Mukuru notable in a conversation about overpopulation is a common misconception it reveals. It is easy to forget that what we’re worrying about when we worry about overpopulation is not really how many people awake each morning, but what those people do each day. It’s a distinction whose importance can be witnessed with great clarity in Mukuru. On a bright Saturday morning there not long ago, more than half a million densely clustered people bustled about, gossiped, and tried to exploit what few opportunities passed their way. Music erupted from radios propped in the frames of makeshift shops. Children played soccer exuberantly with handmade balls, gracefully negotiating the slum’s rutted dirt lanes. Here are some of the things people were not doing: eating imported Argentinian beef. Drinking wine from Australia. Playing Wii on flat-screen televisions. Driving 4,000-pound sport utility vehicles. Driving 1,400-pound compact cars. Driving at all. Using toasters. Shopping for new jeans. Leaving the lights on in more than one room at a time (not an option). Turning on a heater. Turning on an air conditioner. Taking a bath. Urinating into drinking water. Eating corn. Eating beef at all, Argentinian or otherwise. Deciding which pair of shoes to wear. Flying on airplanes. Using toothpicks. Two general misconceptions about overpopulation have achieved broad circulation. The first is that it is, as authors from Stephen Hawking to Dan Brown have written, exponential. It is not. This was a central assumption of Thomas Malthus’ “An Essay on the Principle of Population,” in which he argued that an asymmetry between population growth and food production would lead to global famine. In fact, global birthrates are in a long decline. In 1970 the average woman had nearly six children; today that number has dropped below three. The second common misconception is that rapid population growth is distributed more or less evenly across the globe. In reality, more than half of the world’s citizens now reproduce at below the replacement rate. In many countries, including the United States and India, the birthrate only just exceeds the replacement rate. Population growth remains truly high only in the developing world, mostly in Africa, the Middle East, and Latin America. Projections indicate that these regions will hold the vast majority of the world’s additional people as the century progresses. What they have in common, aside from high birthrates, is poverty. For poor people in overpopulated regions of the globe, high birthrates are pernicious. East Africa, for example, is experiencing a burst of sustained economic growth, but is still desperately poor. Development economists say that for growth there to continue, birthrates must drop significantly. This is unlikely to occur, at least in the near term; contraception and the empowerment of women have helped to diminish birthrates in Africa, but change of the kind East Africa needs takes considerable time. In the meantime, slums swell and proliferate—by midcentury 70 percent of the world’s population will live in cities, and a third will live in slums. Mukuru’s two-roomed iron shacks shelter families of eight or more, and as in other slums around the world, disease is rampant and food and employment are chronically short in supply, which helps explain its appalling life expectancy rates. Whether the Earth has a carrying capacity and whether we are doomed to exceed it is a subject of ongoing controversy. Many scientists do not accept either of those suppositions, but others do. In Countdown: Our Last, Best Hope for a Future on Earth, published in September, Alan Weisman argues that without a decline of several billion people in the current global population, the world faces environmental catastrophe. The impression of a grave, or at least grave-ish, problem enjoys wide currency. There is already an enormous quantity of humans populating the globe—7 billion souls—and how well the Earth’s resources, and most crucially its atmosphere, will accommodate additional billions is unknown. But if the question at hand is what most degrades the health of the Earth and diminishes the plenitude of its resources, overconsumption, not overpopulation, is the greater culprit. Consider the world’s simplest single metric of consumption, carbon emissions: On a carbon scale, one American equals about 20 Indians, 30 Pakistanis, and 250 Ethiopians. The vast majority of the world’s resource consumption takes place in rich countries with little or negative population growth, and virtually all of the population growth projected to occur in the next 50 years will take place in the developing world. Naked human suffering was not immediately evident during my visit to Mukuru, but too many people lacked access to the basic necessities for a healthful and hopeful life. The slum’s smell alone—of burning coal and uncollected human waste—testified to the difficulty of living there. The spread of contraception and, more than anything else, the empowerment of women, have helped lower global birthrates in the past 40 years. But in Mukuru—whose status as a poor, overpopulated slum makes it an emblem of population growth in the 21st century—birthrates remain too high for comfort. Any effort to lower birthrates there and in other overpopulated parts of the developing world seems worthy of the most dedicated support from countries with the wealth to offer aid. But this is an issue that has less to do with the health of the Earth and more to do with the health of the people overpopulation directly affects; overpopulation of Kenyans is not, relatively speaking, a problem for the world as a whole, but it is a problem for Kenyans. The world would almost certainly be better off if there were fewer people in it, but what would really make the difference would be if there were fewer people like, well, the author of this article, who recently got on a plane, cracked the latest Dan Brown potboiler (about, as it happens, overpopulation), and got lost in the ellipses-rich adventures of Robert Langdon for 8,000 miles of high-octane, carbon-spewing jet travel between California and Africa.